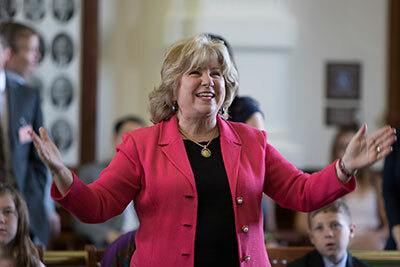 Senator Jane Nelson of Flower Mound chairs the Senate Finance Committee and spearheaded the chamber's budget efforts. (AUSTIN) — The Senate passed its version of the state budget on Tuesday, approving $211 billion in state and federal funds to pay for state services over the next two years. Finance Committee Chair Jane Nelson, who led the Senate's appropriation efforts, said the budget maintains the conservative philosophy of the past while meeting the needs of the future. "This is a budget that will keep our state strong, prosperous and compassionate," said Nelson. The Senate version of the budget remains more than a billion dollars below the constitutional spending cap and represents growth over the last budget of 3.5 percent. Nelson highlighted a number of provisions within the bill, including funding increases to transportation, mental and women's health programs and border security. Transportation funding would increase by almost $5 billion over the last biennium. That includes $2.4 billion in oil and gas tax revenues approved by voters last November and $1.3 billion from ending diversions of transportation funds to other parts of the budget. The rest of the additional money is contingent on passage of a measure that would authorize a one-time shift of motor vehicle sales tax funds to the Texas Department of Transportation. That legislation has cleared the Senate and awaits consideration in the House. The Senate budget would also fund border security efforts at unprecedented levels. Under the spending plan, $811 million would flow to the Texas Department of Public Safety and associated agencies to pay for manpower, technology and training along the border. It also increases the workday for all DPS troopers to 10 hours and includes provisions for grants to local law enforcement to help in border security efforts as well as new training facilities in border regions. Nelson said that the Senate budget also protects the state's most vulnerable populations. The budget would spend $373 million to cover caseload growth in Medicaid. It has $259 million more than last biennium for mental health services and $50 million more for women's health services. It would also increase funding to the Department of Family and Protective Services, including an increase of money to early intervention and prevention programs for Child Protective Services and an overall increase in funds to the department by eleven percent. Now that both chambers have passed budgets, five senators and five representatives will be appointed to a conference committee to hammer out the differences between the two chambers. The two budgets are $1.6 billion apart, less than one percent, but a point of contention will be the way to deliver tax relief. Governor Greg Abbott has said he will reject any budget that lacks tax cuts, and the Senate passed a plan to grant $4.4 billion in property and franchise tax cuts. The House also approved a plan to cut the franchise tax, but would cut sales taxes rather than property taxes. The House and Senate Conferees will have to find a compromise between the two approaches before they can present a final budget to their respective chambers before the session draws to a close on June 1. The Senate will reconvene Wednesday, April 15 at 11 a.m.